Athletes across the competitive spectrum can benefit from compression shorts. 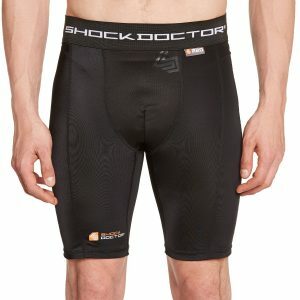 Professional athletes use these shorts to increase performance during physical activity and to promote recovery afterward. Recreational athletes, who might not care as much about maximizing their performance, can still benefit from the increased support afforded by this type compression wear. In this review, I cover the 10 best compression shorts for men and the top five for women. I’ll discuss key features of each model, as well as their pros and cons. If you’re heading into this unsure which is the best brand of compression shorts, hopefully, you’ll learn something that will tip the scales in one direction or another. Enjoy! A friend of mine recommended these shorts to me and I was in need of a pair on short notice due to a training session I had with a few guys down at the local Dojo. I’ve owned Champion brand clothing before and would usually use their sweats for laying around. I knew they were comfortable but I was unsure of how they would handle compression wear. Turns out I was wrong for thinking that because they were pretty comfortable and stretchy. Also what I liked about these specific ones is how good they wick moisture (pulls moisture off from the body to the exterior of the shorts). I have to mention – Champion compression shorts for men didn’t rub my skin weird, the way some have done in the past, Yes I’m talking about your Nike. I’ve never really been a fan of Under Armours’ clothing, only because I view them as a trendy brand that doesn’t care to put too much effort into their clothing so much as they do their brand name. In my opinion, these particular shorts are great for any outdoor activity and are made out of a great material. By the way, what’s cool about these is that they have anti-odor technology, which prohibits growing and expansion of odor-causing microbes. Well, this is awkward, we were just discussing you, Nike, all good things, I promise just don’t scroll up. I’ll start of saying that these are ones of the best Nike compression shorts. These’re great for things like Martial Arts or other activities that require a wide range of movement. Because of the material and the flat-lock seams you won’t get any kind of skin rash from rubbing and they are great for keeping your body temperature regulated. Durable especially that waistband, so wash them as much as you want. Expensive but hey, at least you get that neat little swoosh. Some people think the waistline is a little too low. Here is a great pair of shorts from a company I’ve never actually heard of and that’s okay. These ones felt great to touch because the feeling of shorts like these usually makes me itch inside. They also move with you wherever you go and don’t bunch up on you, that’s impressive for shorts that try to act as an extension of your body. So good on them for making a pair of compression shorts that don’t feel like they’re trying to kill you. Jokes aside, what is interesting about these is that they have Lycra blend material, which is antibacterial and in addition have SPF 50 (sun protection factor) sun protection. Tommie Copper is one of my favorite brands. I use their sock and elbow bands all the time and they really make a difference when you’re going all out. Really they even make a difference for everyday wear and that’s something people really need throughout the day. Years of wear and tear catch up with you fast. Similarly to previously mentioned compression shorts, these have a special fabric which is designed to eliminate odor causing microbes on fabric and it uses moisture wicking technology. They are nice and long too so you never feel weird when you’re wearing them with just a t-shirt or something like that. These ones don’t cost much either and you can really find them anywhere. Shock Doctor makes some of the best compression wear you’ll ever see. They often come coupled with a cup when you buy them, so jump right on that when the opportunity comes up. Funny name for an effective product though because as much of a child as some men tend to be, they don’t often ask someone to kick them in the dangly parts. That is until their shorts had a built-in cup. Just so you know, it’s still going to hurt but good on them for trying. Oh god do these things feel gross. It’s like putting on wet rubber but baring that complaint I really don’t have anything bad to say about these shorts. They felt as if they weren’t even there and after I was done for the day I didn’t have any chaffing so I count that as a win. These ones are perfect for everyday wear as well as harsher activities like biking or wrestling. I also read that they provide proper surface tension which in turn helps blood circulation. I honestly wouldn’t know the difference in performance because after three or four hours of training I’m usually ready to die anyway but I really have no reason to doubt clinch gear. Keep in mind that I didn’t buy many of the shorts on this list but clinch gear is an effective brand that is well known for quality. These things are like regular shorts and probably among my favorites on this list not only for their length but for the fact they resemble the look and feel of cotton so well. 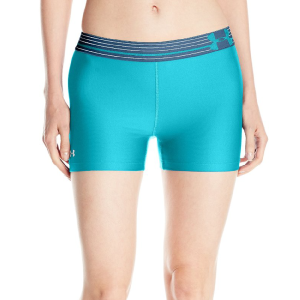 Though one thing to keep in mind is that these shorts doesn’t offer the best compression. When compared to previously mentioned Under Armour or Nike, these feel kind of loose. I didn’t use these ones myself but I have a friend at the gym who wears them regularly and says that he will never buy another pair again as long as these are still being sold in stores or online. He told me that they fit perfect no matter what size you get because they are form fitting and can be used or any type of activity. He mostly uses them when working (he does construction) or when he is training for matches (he’s a world class kickboxer). In my honest opinion, they are ugly, but they are supposed to be worn underneath stuff. Russel athletics has been making training/outdoor/activity wear for years and now that compression wear is a thing, they have moved into this area. They’ve done a pretty good job of it so far. the material is super thin, like yoga pants status but the waistband is a poly-cotton blend so they should be very comfortable for anyone wearing them. It should come as no surprise at this point that I’m not a woman, although I would totally wear these if I could fit myself into them. I asked a few women at my gym if they had ever used Nike brand shorts before and only one of them had. She said they were her favorite pair and when she opened up her gym bag I could see that was definitely the case because she had four pairs of the same shorts. She said they were for the entire week at the gym. I asked her why she loved them so much and she just said because they are so comfortable. So apparently Nike really cater to women in this department. If we’re talking about the fabric, it uses well known dri-fit technology, which helps to wick sweat away. These shorts also have super flat seams, to prevent chaffing from happening. The ATD women’s brand has been around for awhile and from what I know of them, people generally regard their products pretty highly. I asked around and most women seem to use this exact product as everyday wear. They told me that the material is soft and it just keeps everything where it’s supposed to be, which is probably my favorite reason ever for someone choosing one brand over another. I’m told they breathe and keep moisture off and that seems to be all that women want them for. Again a brand I don’t much care for has made the same product for women but apparently a thousand times more comfortable and easy to wear. Not sure what the deal is with that but women like them and as long as the target audience loves them, who cares what the rest of us think right? These ones are easy to get on and off and have a comfortable waistband. Waistbands seem to be the center of most complaints with both men and women. One of my friends – Stacy told me that they tend to ride up when she is working out, but then again it might be because she has pretty muscular thighs. Adidas really knows how to make comfortable shorts. Whether it’s for men or women they never seem to fail when it comes to underwear or outerwear for that matter. Most women seem to love this particular pair because of the way the material feels and looks. It also comes in a variety of colors that everyone loves. I’m told that they have a loose feel to them so you don’t feel smothered when you are working out. What else I found out is that these shorts have some pretty neat fabric, which uses Adidas climate technology so it has UV protection and great moisture management. Not the best shorts on this list and can be a bit pricey but for what they are you really can’t complain too much. The material is a little scratchy like most other Under Armour products these days, they don’t really hold up the way they should when you go to wash them. Not to say that they will fall apart the first time you wash them but I wouldn’t wash them constantly otherwise you’ll be buying new ones very soon. Anyway, what is interesting about these – they have a hidden pocket. They do fit very nice and as women say, they keep everything where it belongs. I’ll literally never get over that statement, it’s too funny. When you look at the enormous waistband, they sort of look like yoga pants however they can be used for much more than that. In truth, compression shorts are closer to fitness equipment than they are to clothes. You might buy a tee shirt because you like its design, but you probably wouldn’t with compression shorts. For one thing, they’re usually worn underneath athletic shorts and thus aren’t exactly on display. On the other hand, durability is really something to pay attention to. Compression shorts don’t have to be expensive, but they certainly can be. If you drop more than 20 dollars on a pair of compression shorts, you want to be sure you’re going to get a fair bit of use out of them before they lose their elasticity and compression. The more durable models in this review are the Nikes, Tommie Copper, and 2XU shorts. To maintain the durability of your shorts longer, be sure to air dry them rather than run them in the dryer. 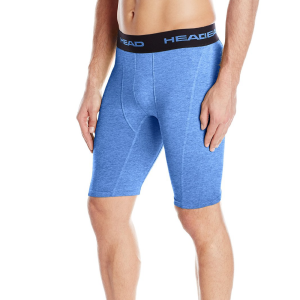 It seems obvious, but one of the things to look for in compression shorts is…compression! The amount of compression you’re searching for depends on what you want to get out of your shorts. If you’re interested in compression shorts primarily for reasons of style, warmth, or chafing protection, you don’t need to worry too much about this. If, however, you’re more interested in the performance-enhancing capabilities of this type of apparel, you definitely want to pay attention to what kind of compression each pair of shorts offers. Some shorts will offer a good deal of support without much compression, which is kind of the middle of the road. Then there are shorts that are explicitly designed to compress the leg muscles. If you’re a serious athlete, these are the ones you want. Unless you have prior experience with compression shorts and know what you’re looking for, the best way to make sure you’re getting the right amount of compression is to try them on for yourself. Lastly: the all-important question of money. Like I’ve said before in this compression shorts review – they aren’t always cheap. Some of the more expensive models can cost over 60 dollars, though solid compression shorts can be found for quite a bit less. Again, think of these as equipment rather than clothes. How serious are you about sports? Does it make sense for you to spend 60 dollars to improve your workout efficiency? It might. Or it might not. That’s really up to you to decide. Personally, there’s a limit to how much I’m willing to spend on compression shorts. I feel like after a certain amount of money, you’re really paying for the brand name more than anything, as with Under Armour and Nike. You can probably find similar quality equipment for less if you aren’t picky about getting brand name compression shorts. And remember: they’re worn under your shorts. A label isn’t going to be very visible in this case. If you want my personal opinion, for men’s shorts, Tommie Copper shorts are great. Their quality to cost ratio is superb, and they are highly durable and comfortable. I’d rather spend less money and sacrifice the supposed benefits of a well-known label than pay too much for a product that isn’t really that much different.